The Texas mountain laurels (Sophora secundiflora) have been fragrantly—and some would say flagrantly—flowering all around Austin. This is another plant I didn’t want to miss this year. When another Austinite posted a photo of it in full bloom on her blog, I thought I was sunk. But I called a friend outside Kerrville who has quite a large tree, and she said hers have only just set buds, so I may get to see one bloom after all. Even more than wisteria, they remind me of the lilacs that I grew up with: both fragrance and flower. The density of the flowers on this one is akin to the redbud you showed. You must be having a very fine spring up there. I’m glad to hear you won’t miss it this year. I get the impression that that part of the hill country averages a few degrees cooler than Austin, especially overnight, and that difference must be enough to have delayed your friend’s tree. The Texas mountain laurels in Austin are still at their peak and none that I’ve seen have started fading. You may see some good ones on your way to Kerrville if you get off the Interstate and drive through some of the towns. If you go via San Antonio, which seems likely, keep your eyes open for more fragrance (oh, synesthesia), this time in the form of huisache trees. We saw a few good ones near the San José Mission 10 days ago. The huisaches in Austin still haven’t done much. The first image looks like Hebes, but on closer inspection much woodier stems and the flowers completely different. But the colours are the same. Love the individual flower portrait. And fragrant? Wow! I bring that up because a lot of people say the flowers of Texas mountain laurel smell like grape Kool-Aid. Some people find the fragrance delightful while for others it’s so strong as to be cloying. 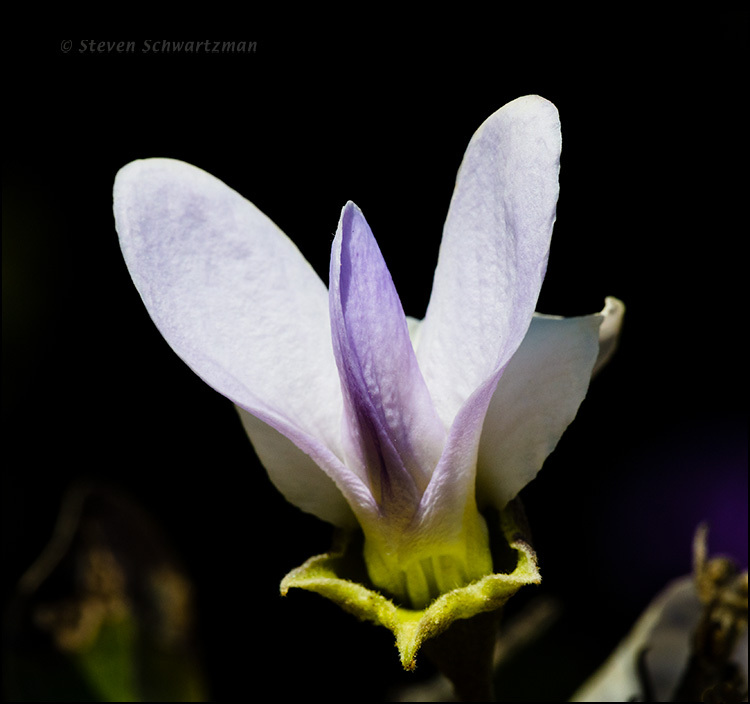 You’re right that the legume family is known botanically as Fabaceae (think fava beans). 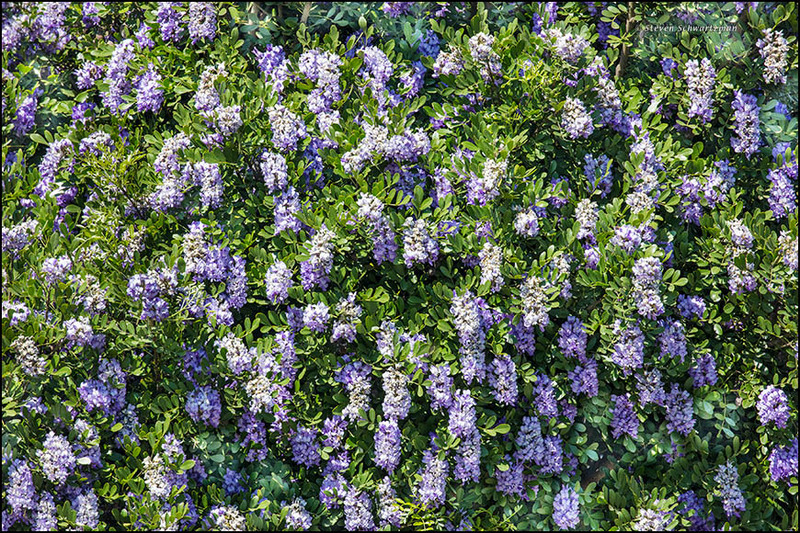 Your comparison of Texas mountain laurel flowers to those of its family-mate wisteria is an apt one. Where wisteria is a woody vine, Texas mountain laurel is a small tree. I loved Texas Mountain Laurel from the first time I smelled its unusual scent. Sadly, they do not like our climate on this end of Texas. Now you’ve got an incentive to move to this part of the state. Okay, so that may not be feasible, but you can visit each year when the Texas mountain laurels are in bloom. I had to look up lemon thyme to see what you’re envisioning. After you left your comment, I mentioned to a previous commenter that many people say the flowers of Texas mountain laurel smell to them like grape Kool-Aid (if you’re familiar with that). I gather that Thymus citriodorus has a lemony scent. I looked up your lemon sherbet sweets and found that Bassetts is a popular brand. As far as I know, we don’t have that over here, though I imagine some American specialty shops may stock it. One thing that’s doubly confusing about Texas mountain laurel is its name. The plant is not a laurel (Lauraceae) or even a mountain laurel (genus Kalmia in the Ericaceae). Too bad someone couldn’t have come up with a unique vernacular name. The older lemon sherbets that I had as a kid (long, long ago) were much better than the ones today. Mmm… yeah, that is confusing. Talking of ‘real’ laurel, though, when I was a kid we had a laurel bush in our garden and my sister and I would make ‘boats’ from its leaves and float them in puddles. Did you ever do that? You need stiff, evergreen leaves for it. No, I don’t recall making boats from leaves in New York. On the other hand, my wife is from the Philippines, and I’ve heard that children there do lots of things with banana leaves. Beautiful…seems like everything came alive a week after I left Austin! At least when we drove around town you got to see plenty of redbuds flowering (though not the one in yesterday’s post). The Texas mountain laurels seem at their peak now. Bluebonnets have finally come out, including on an embankment that we passed regularly on Mopac. Too bad you couldn’t have come a few weeks later. Beautiful! I so love Texas Mountain Laurel. We don’t have it in Cypress like you see in th Texas Hill Country. Wish we did! From Cypress to Austin is just a two-hour drive on US 290. You still have time to zip over and see the Texas mountain laurels while they’re at their peak. A good place to do that would be the Lady Bird Johnson Wildflower Center, where many other native plants are blooming now as well. 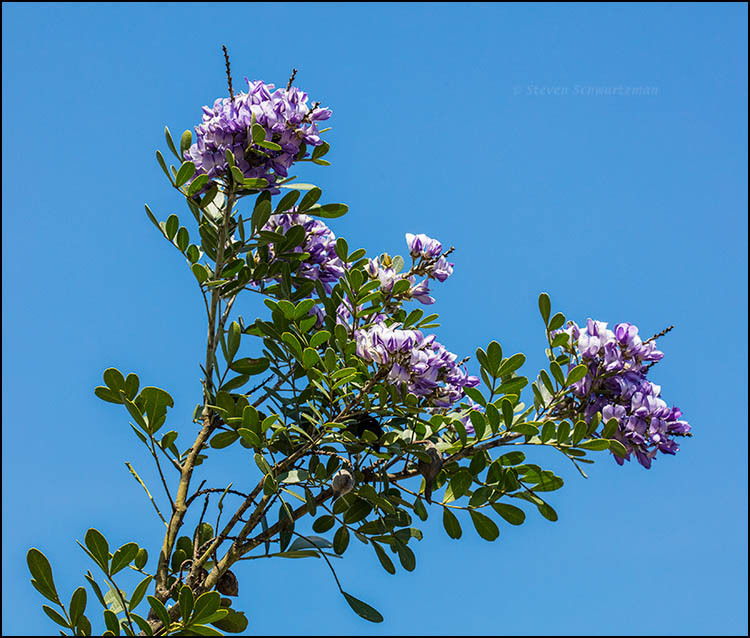 Texas mountain laurel is among the flowers the state is best known for. Thanks, Reed. I wish you could experience Austin in person at this time of year. Gorgeous… spring in full bloom! It came a little late this year, but now there’s no denying it. Someone else just recently wrote about another species of sophora. I actually grew this one from seed years ago, but had to give them away. We have nothing here comparable to them. Other sophoras might sometimes be found in nurseries, but not this one. Wow, this is so pretty! Almost enough to lure me to Texas! I notice that the areas of it being native that you mention above are all arid. sigh. Well, it might still lure you for a springtime visit. You probably wouldn’t enjoy the half-year of summer heat that people who live here put up with.